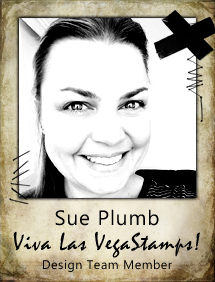 It's Sue Plumb here to share my latest design team project with you. Today I am sharing a piece I created recently that was inspired by this month's awesome "For the Birds" challenge. 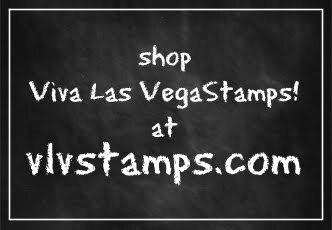 It also showcases one of the amazing new release stamps, which I couldn't wait to use! 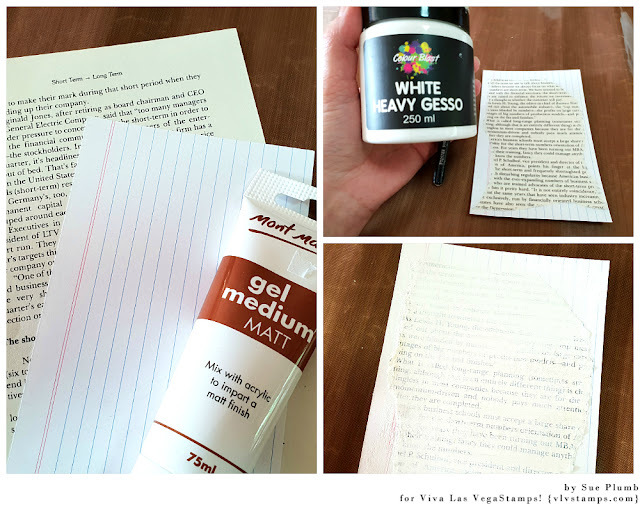 To begin my project, I used some gel matt medium to adhere some book paper onto the index card. I then applied heavy white gesso using a brush. 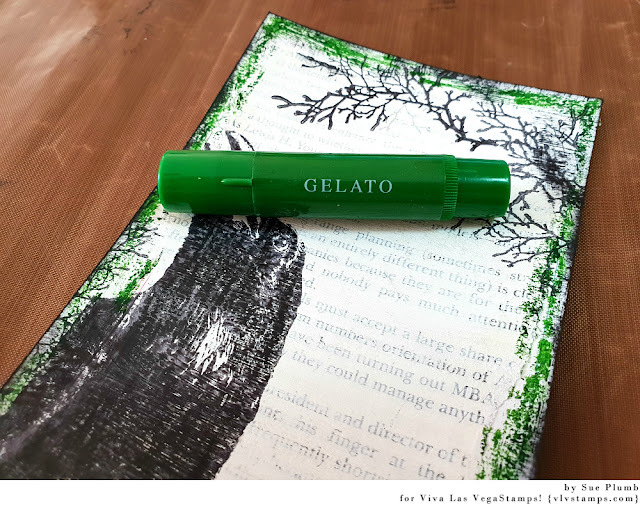 I chose to use a brush as I wanted the texture of the brush strokes to show through; but in hindsight, next time I will go a little thinner with the gesso so the text is more visible on the finished piece. 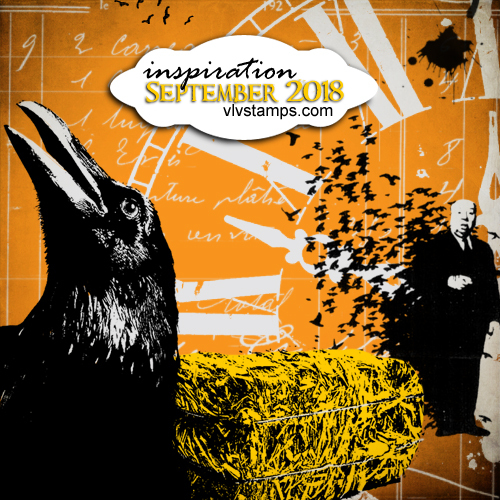 After the background was prepared; I used black Staz On ink and the new Raven Looking Up stamp as the focal image of my piece. 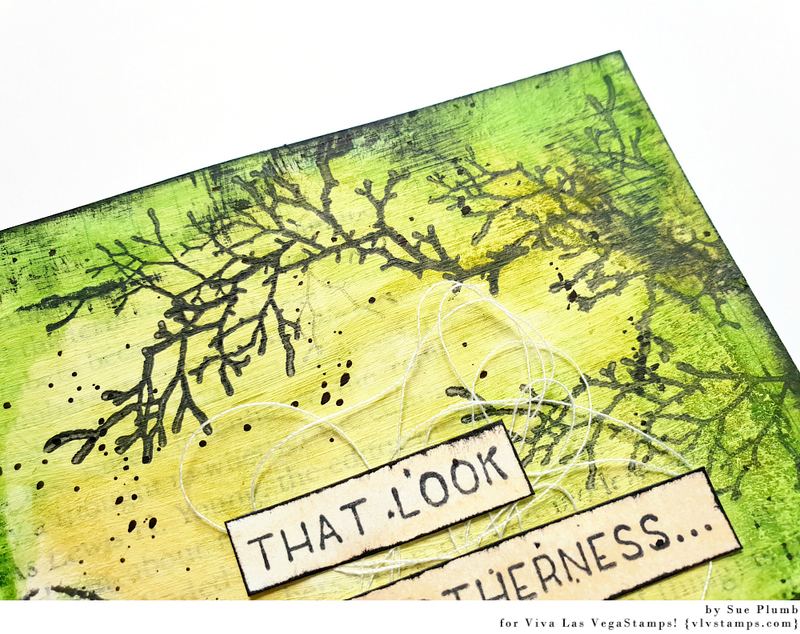 I then added some tree branches across the top and bottom of the card using the Branch Antlers stamps. I also inked around the edges of my card. Next, it was time for some colour! 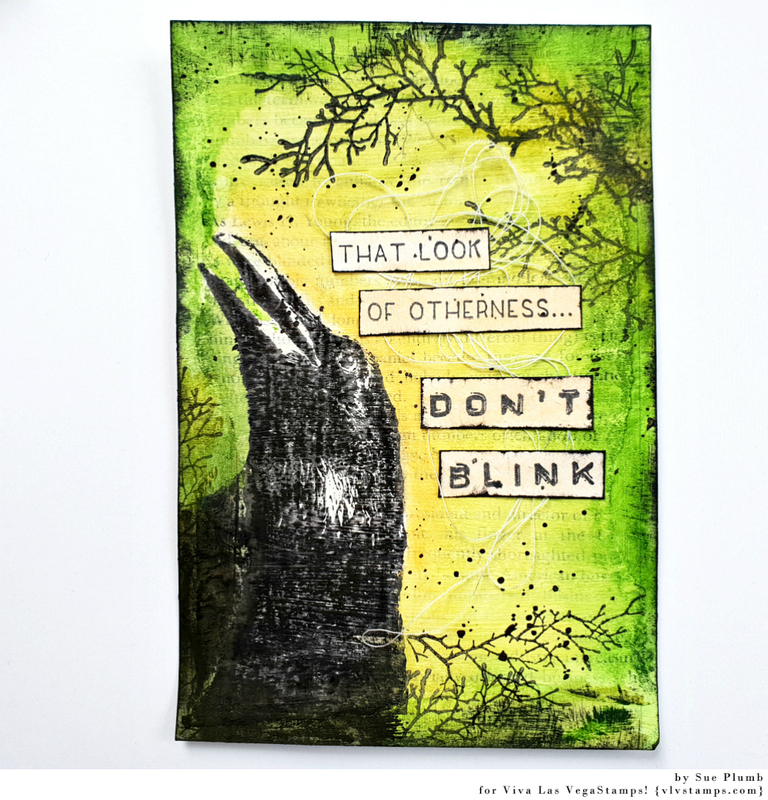 I wanted my piece to have an eerie feel, so I opted for green as the main colour. I used Faber-Castell gelatos to scribble gently onto the card, then used a baby wipe to blend the colour out. I started with the darkest shade around the edges of the card, moving towards lighter shades in the middle. 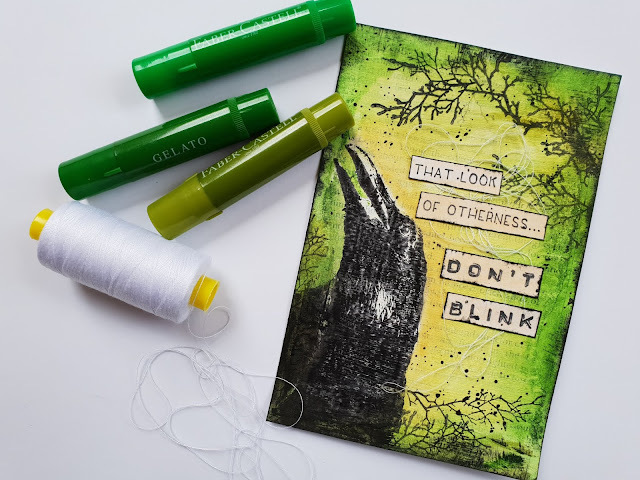 In the centre of the card I used a yellow, blended with a small amount of green; and along the edge of the raven's silhouette I also added a small amount of orange. Once the colour was complete, it was time to add some text. 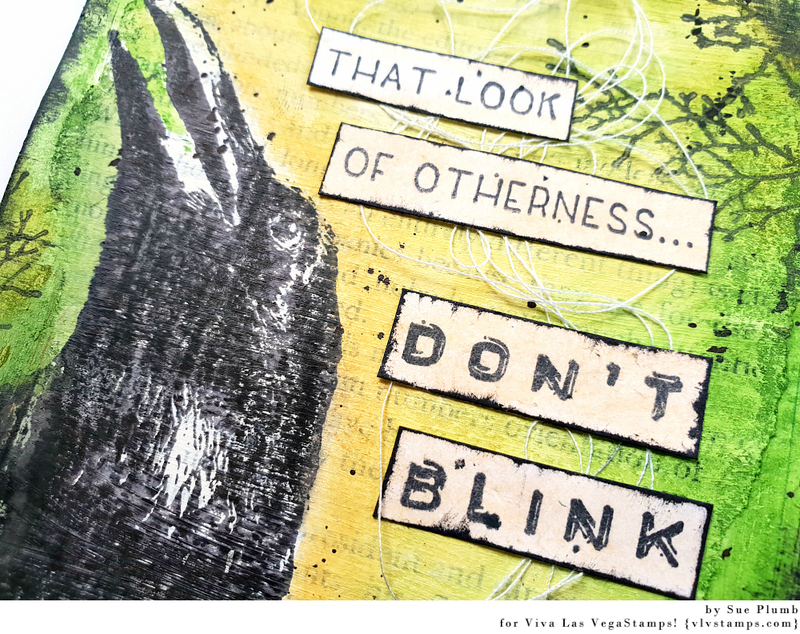 I used the recently released That Look of Otherness stamp and combined it with Don't Blink to form my focal quote. 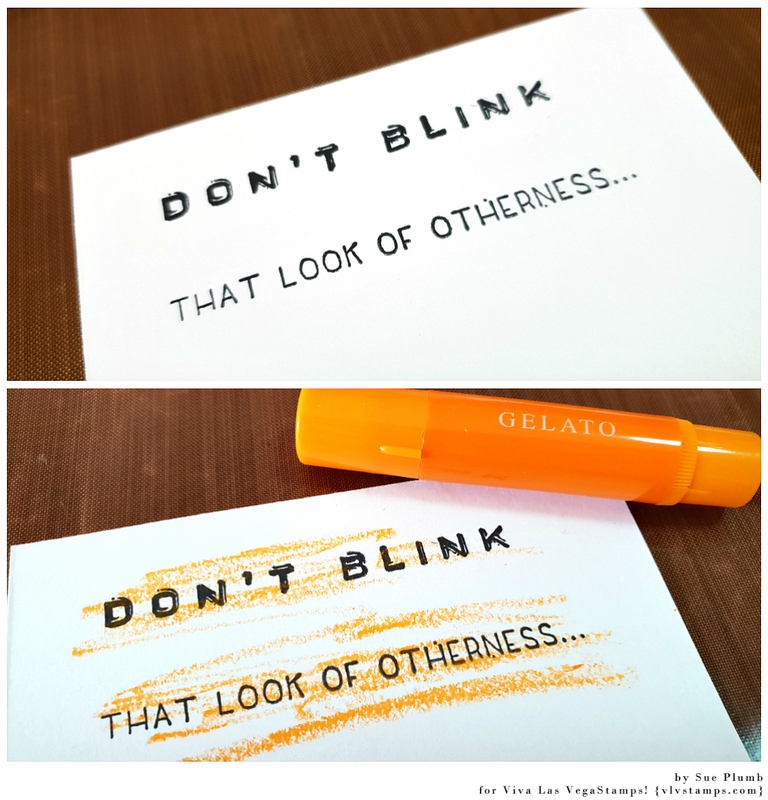 I stamped each of them out on some scrap white cardstock, then used the orange gelato and a baby wipe for blending to add a small amount of colour over the top. 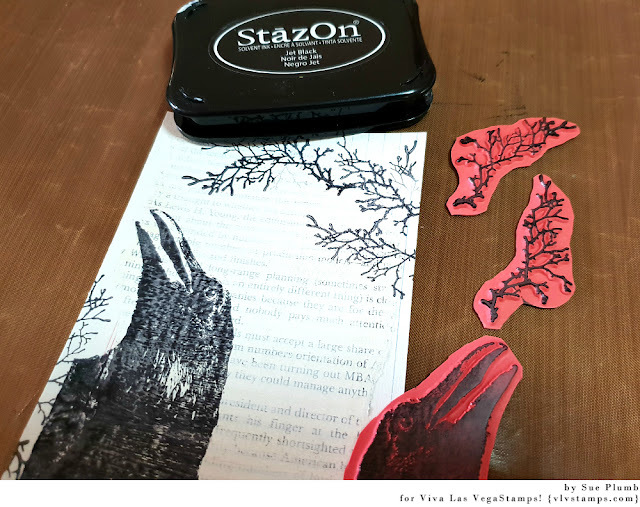 I then cut the words out and inked the edges of each piece with black ink. To add some texture to my project, I added some messy white cotton thread before sticking the pieces of the quote down. To finish off, I used Colour Blast 'Soot' Colour Artist Ink and a small brush to add some fine splatters randomly around the card. Thanks for stopping by so I could share this with you. 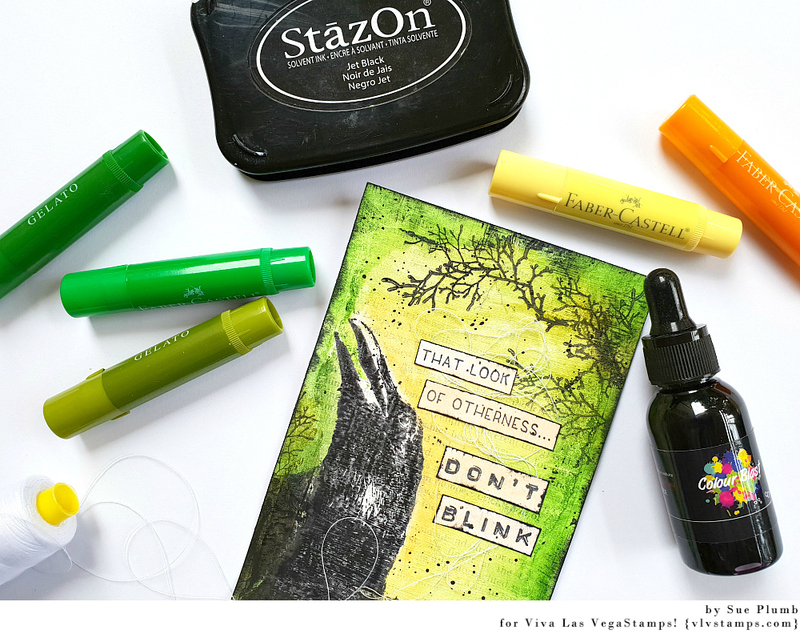 I hope I have inspired you to get inky too! Labels: branch antlers, Design Team, don't blink, Faber-Castell Gelatos, index card art, inspiration, look of otherness, mixed media, monthly challenge, raven, sue plumb, Viva Las VegaStamps!